"New York, Pennsylvania, New Jersey, and Maryland, with a combined population smaller than Poland...have more automobiles in service than the whole world outside of the United States," wrote William Joseph Showalter in his October 1923 National Geographic article, "The Automobile Industry." Pictured in that issue was one of those New York cars in service—to a higher power. 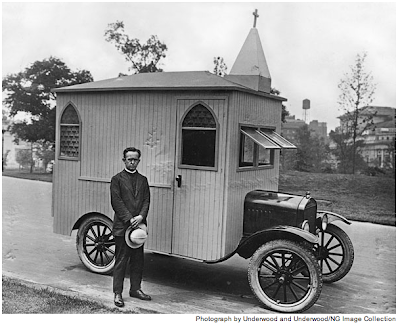 The Reverend Branford Clarke's Brooklyn-based "traveling chapel" was equipped with stained-glass windows, an organ for his wife to play, and a fold-down steeple to help the whole thing fit in his garage.